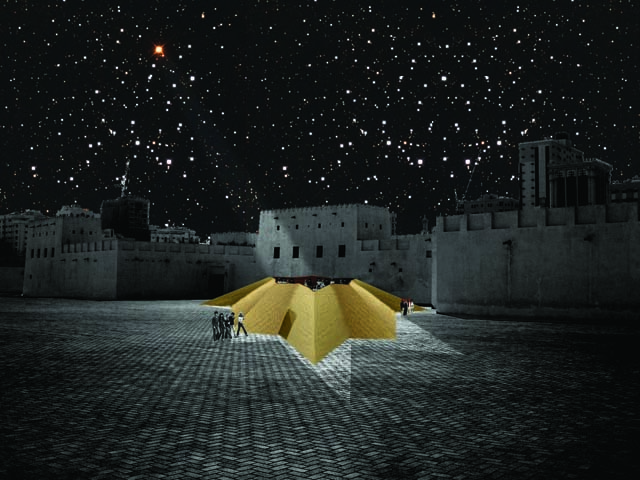 Our proposal for Sharjah Art Foundation Production Programme is to build a temporary pavilion to host the first stage of the Star Museum, a travelling museum dedicated to the stars. The stars in this museum are not intended strictly in their astronomic or astrologic meaning, but mainly as a symbol and formal archetype. The pavilion is not conceived as a self-sufficient architectonic structure, but as an element being part and dialoguing with the landscape. 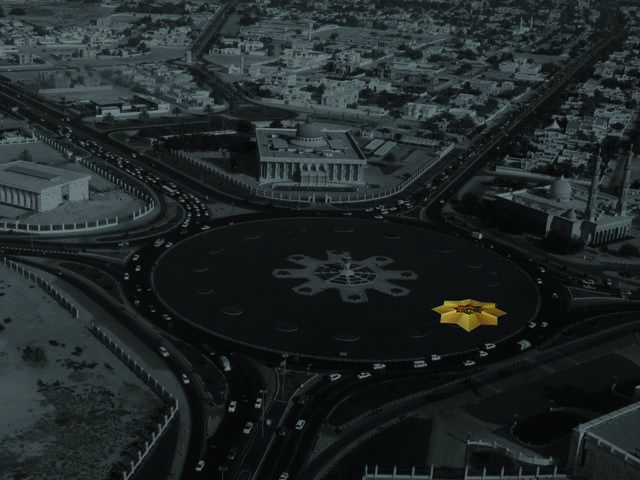 Star Museum is a travelling museum: the first stage should have been in Sharjah, but then the museum will find new places to exhibit its collections. Star Museum is a dynamic museum: at every geographic displacement will correspond an increase of its collection and a variation of its exhibition space’s configuration. 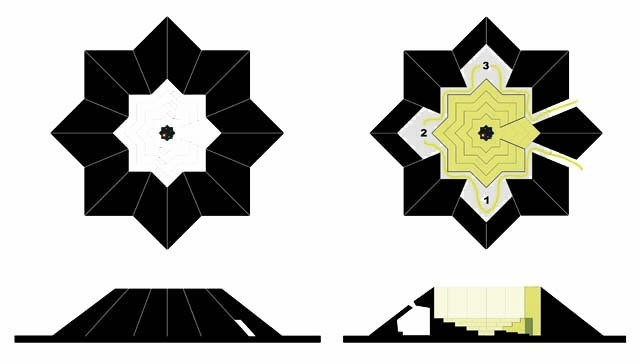 Star Museum is constituted by a technologic unit, easily transportable if needed, around which a temporary (or semi-permanent) set up is built, different from time to time according to the materials, technologies, forms, languages, characteristic of each location. Star Museum is a temporary structure, but it’s in its nature to leave a permanent, but respectful for its environment, mark. Planting trees, for example, or leaving back part of its structures if they could be still useful after the end of the event. Star Museum is also a place for the contemplation of the nature and of the specific features of each landscape in which it is placed. Star Museum displays materials and objects of various nature, the collection of which from time to time, is done in collaboration with the local cultural communities and institutions (museums, universities, research centres, etc. ), but it is or can be also conceived as a place to host performative events, meetings, lectures, or only as an archive open to the public. It is our intention to encourage visitors to leave contributions to the research and the collection. 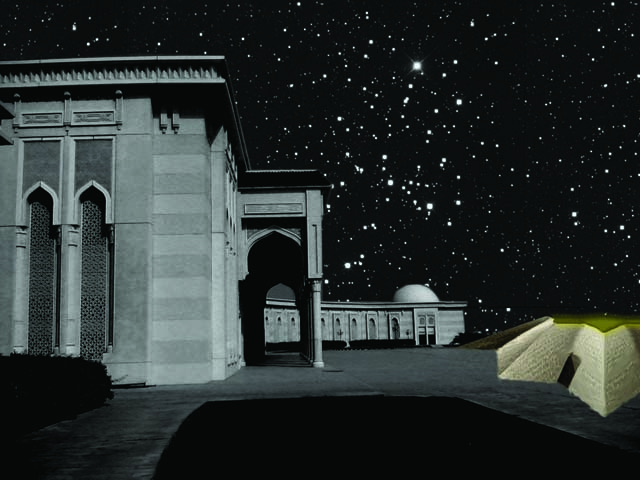 The set up of Star Museum’s pavilion will consist of a main open air space, a sort of amphitheatre shaped like the Islamic polygon star and a series of very small covered rooms around it, distributed by a corridor. The whole structure will be conceived like an earthwork, from outside it will be similar to a small hill, geometrically shaped, almost like ancient European fortresses from the 16th to the 18th century, as a result of the combination of the slopes generated by the central star. The technologic unit will be constituted mainly by a photovoltaic generator with batteries etc., sufficient to feed a pc with wireless internet connection, sound diffusion and a basic lighting system. The exhibition will be mainly enlightened with natural light. The technologic unit should be easy to be transported and stored allowing us to reuse it for the next stages of the project. The interior spaces could be made with a wooden or metallic structure but also with more heavy constructive techniques (bricks, concrete, etc.) according to the local tradition, the budget available, and so on. Also the characteristic of the exterior could change according to the site resembling a green hill, a dune of sand, an artificial mountain, a floating rock, etc. Concerning the exhibited materials, the basis will be the digital archive of images that we are collecting in our blog and that will be visible in a monitor in every stage of the project, witnessing the increase of the Star Museum’s archive. For the selection of specific materials or activities to be developed inside the Star Museum, we’ll be glad, in case our project will be selected, to be put in contact with local institutions or members of the local cultural community, devoted to the study of Art or other disciplines that could be useful to our research. Generally speaking it is not absolutely necessary to have precious original art pieces available for exhibit or to collect a big amount of object or images (even if also these two could be options to be taken in consideration) being the main concept of the Star Museum to play with the symbolic meaning of its object, its architecture and its environment to make a link between stars, men and earth. The star as a decorative pattern is very common to different cultural and artistic traditions and it’s particularly tied to Islamic artistic tradition. The star is an universally recognized symbol, that belongs to the collective imagery of every people and that all along prompted men to stare up to the sky. It is also possible to link its symbolic meaning with the tradition of astrologic wisdom, deep-rooted in the Menasa region. The power that emanate from this symbol keeps its appeal still alive, as it is visible in the work of many contemporary artists. The star is than a symbol of the relationships between different cultures and of the links between present times and history. This is the reason because it’s so fundamental for us to find an interaction between our project and the different local cultural communities. Beyond the formal fascination for the star, the main objective of this project, and in general of our work, is to realise architectures that dialogue with their physical context and with the cultural and social environment in which they are placed, building a relational space not only dedicated to the display, but also for the people to meet.